On Jan. 13, the Cinema Village will host the New York City premiere of Vince Giordano: There’s a Future in the Past, the story of the composer, musician and bandleader’s unique career as a purveyor of hot-jazz music and culture. Giordano’s contributions to film and television soundtracks include The Aviator, The Cotton Club and HBO’s Grammy Award-winning Boardwalk Empire. With his band, the Nighthawks, Giordano is a staple of the NYC scene, performing his own compositions as well as the music of Duke Ellington, Louis Armstrong, Fletcher Henderson and others. 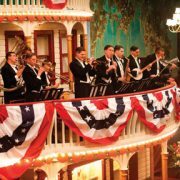 Created by veteran director-producers Dave Davidson and Amber Edwards (Michael Feinstein’s American Songbook on PBS) and released by First Run Features, the 90-minute film covers not only Giordano’s significant musical contributions, but also his efforts as a historian and preservationist, providing a glimpse into his vast library of some 60,000 band arrangements, musical instruments, hot jazz-era films and 78-rpm recordings. It’s a labor of love for a man who has helped to keep alive a style of music-as well as dance and fashion-whose popularity has ebbed and flowed over the years. The behind-the-scenes views of the creative process, including songwriting and rehearsals for Boardwalk Empire, shed light on the work that goes into the art. And, as the self-proclaimed “King of Schlep,” Giordano is revealed as a one-man booking agency and road crew-finding the gigs, driving the van and setting up 400 pounds of gear at each show. Vince Giordano: There’s a Future in the Past opens Jan. 13 at Cinema Village, 22 East 12th St., New York, with showings in other cities to follow. For more information, including future play dates and the film trailer, visit First Run Features.